Kanye West took his family on #FamilyFeud. We’ll definitely be catching THAT episode! 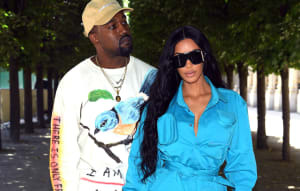 It looks like Kanye West and Kim Kardashian's families are set to square off against each other in what will likely be a legendary episode of ABC's Celebrity Family Feud. Kim K leaked the news on her Snapchat today, posting multiple videos of Kanye and the Jenner/Kardashian gang on the set. Yeezy looks the most excited to appear on the game show as a clip surfaced online of him damn near shouting, "I've waited my whole life for this moment!" Team West looks to be made up of Kim, who apparently jumped ship from team Kardashian after they wouldn't let her in the team huddle, Kanye and Jonathan Cheban while the Kardashian Jenner team team is headed by Kris, Khloé Kendall and and their grandmother M.J.